Known as Willie. Birth registered as William Henry Campbell GASON. Surname sometimes given as GAYSON. Height 5 feet 5 inches. Weight 126 lbs. Chest measurement 31-33½ inches. Complexion ruddy. Eyes blue. Hair red. Eyes both correct, right 5/5, left 5/7.5. Hearing good. Colour vision normal. Limbs and chest well formed. Full and perfect movement of all joints. Heart and lungs normal. Teeth - 2 or 3 carries. No illnesses. Free from hernia, varicocele, varicose veins, haemorrhoids, inveterate or contagious skin disease. Vaccinated. Good bodily and mental health. No slight defects. No fits. 20 September 1916 wounded; 26 May 1917 - admitted to B. Hospital, Arques; 17 to 29 June 1917 - admitted to Hospital in France, suffering from inflamed connective tissue in the knee. William Henry Gason (Willie) was the eldest son of John Henry Bennett (Henry) Gason and Mary Elizabeth (Rose) née Campbell, of Temuka. Born on 3 January 1896 at Temuka, he was baptized on 2 February 1896 at St Joseph’s Catholic Church, Temuka. In some early newspaper articles the name is spelt Gayson. Later in 1896 his father Henry was successful in the ballot for an allotment in the Orakipaoa settlement near Temuka. Willie attended Milford School and the Temuka Convent School, he being member of St Joseph's Roman Catholic Church, Temuka. For some years from the mid 1890s his father served on the Milford School Committee. He was also elected to the Crown Tenants of Temuka committee and was a regular attendee and contributor at the annual householders meetings. The disastrous floods of March 1903 did a large amount of damage at Orakipaoa, and in a matter of days only two occupants remained at the settlement – Mrs O’Mara and Mrs Gayson. The annual Milford School treat and distribution of prizes in early January 1903 had to be held in the schoolroom, because the very wet weather prevented the committee from holding the picnic as usual at the “Green Hayes” residence of Major and Mrs Hayhurst. On this occasion William Gayson was presented with a prize for Preparatory class II. Fortunately in December 1904 the Greenhayes’ grounds “never looked better” than when the Milford children held their picnic there. This time William received a prize for Standard I. The following year the children had had their refreshments, and had amused themselves with boating on the creek, games and other enjoyments, before the rain came and curtailed the running races. One race was held – the Committee race for Major Hayhurst’s very handsome silver teapot prize. Mr Gayson, running off scratch, finished in sixth place. William was rewarded for second place in Standard III General Efficiency and the Standard III spelling prize (presented by Major Hayhurst). In 1908 Willie was awarded a prize for writing and spelling in Standard IV at St Joseph’s school, Temuka. Before ever enlisting for war service, William had incurred fines – a fine of 5 shillings in October 1913 for failing to render personal service as required by the Defence Act, and a fine of 10 shillings, in January-February 1914 when a Senior Cadet, for failing to render personal service under the Defence Act, by absenting himself from parades and drill (from 2 June) without leave. William Gason was farewelled at the same function at which his brother Alfred was welcomed home, having volunteered before his brother's discharge was known and now being seen as taking his brother's place. A large number of friends and soldiers gathered at the home of Mr Harry Gason at the beginning of March 1916 for an enjoyable evening of games, songs and dances, and when also some “capital patriotic and recruiting speeches were made”. An old neighbour referred to the esteem in which the Gason family was held and to the pride that the parents would feel in their two soldier sons. Willie was presented with a fine money belt by several of his immediate friends, and wished “God speed”. William Henry Gason had enlisted on 16 December 1915, aged 20 years 11 months, a farmer employed by his father. Although of relatively slight build, he was passed fit and in good health, with just 2 or 3 carries in his teeth. He nominated his mother, Mrs Rose GASON, Temuka, as his next-of-kin. He had previously given two years with the Territorials and was at this time serving with the 2nd South Canterbury Regiment. Private Gason embarked on 1 April 1916 from Wellington for Suez, Egypt, with the 11th Reinforcements Details (To Make Up Shortages in 10th Reinforcements), Canterbury Infantry Battalion, C Company. On 10 May 1916 he left from Alexandria for France. Mid October 1916 news came through that he had been wounded on 20 September. Twice before year’s end he rejoined his battalion, the second time after a spell in the Field Ambulance. On 26 May 1917 he was admitted to B. Hospital at Arques, with scabies. He spent from 17 to 29 June 1917 in hospital in France, suffering from inflamed connective tissue in the knee. The official hospital listed him as a Not severe case. 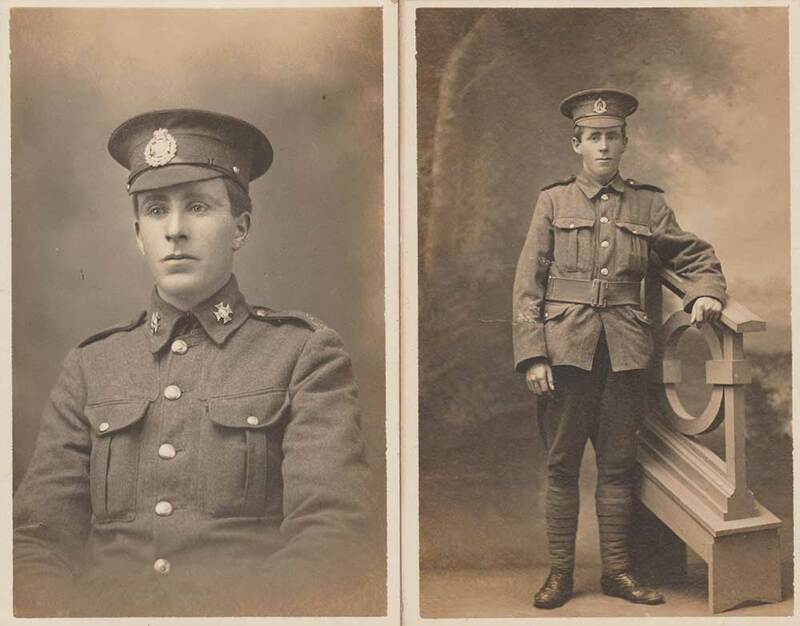 After hospitalisation and a brief period of leave in England he rejoined the Canterbury Regiment on 21 September. The next communication came to Mr H. Gason in October 1917 – 21-year old Private William Henry Gason, 6/4248, Canterbury Infantry, had been killed in action at Passchendaele Ridge, Ypres, Belgium, on that fateful day, 12 October 1917, when about 845 New Zealanders died in one day in a failed attack in the mud and bunkers. The South Canterbury Division was used to attack the opposing trenches at Passchendaele. The natural drainage had been destroyed by shells and the water was lying in great pools, In addition, when the order came to advance, it was found that none of the wire had been cut. On advancing, the New Zealanders were cut to pieces and impaled on the barbed wire. Some were blown to pieces, others drowned in the water-filled shellholes. One of the hundreds whose bodies were not recovered, W. H. Gason is remembered on the Tyne Cot Memorial, Tyne Cot Cemetery, Zonnebeke, West-Vlaanderen, Belgium. His name is inscribed on the Timaru Memorial Wall, Timaru, the Milford War Memorial, the Temuka RSA Roll of Honour, the Temuka War Memorial, and St Joseph's Church, Temuka, Roll of Honour. From 27 October 1917 his name appeared regularly in the Temuka Leader Roll of Honour under the inscription “Greater love hath no man than this, that a man lay down his life for his friends.” An In Memoriam notice was inserted in the Timaru Herald on the 1918 anniversary of his death, and again in 1919. The name Gason W. H. Pvt. 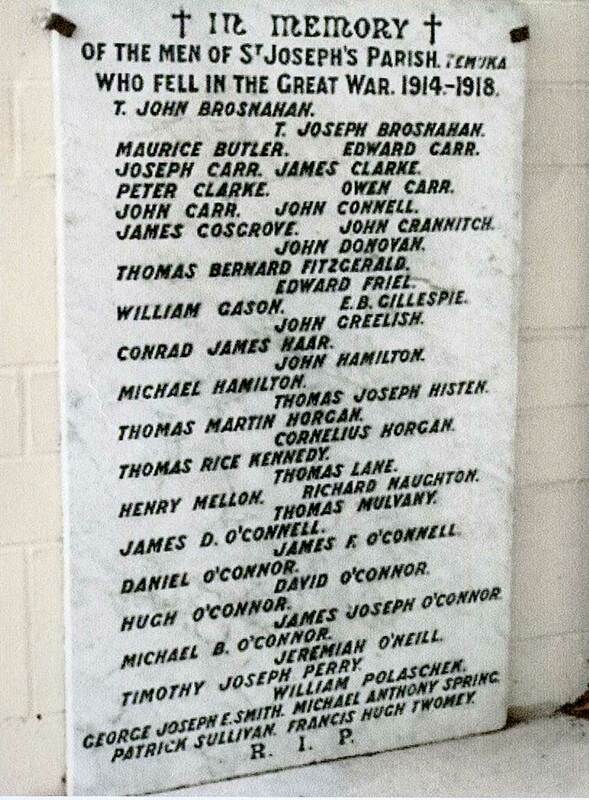 appeared in the 1921 list of names to be inscribed on the Temuka Memorial. In August 1922 the Temuka Borough memorial was unveiled before a very large gathering (more than 2000) in the domain, including Temuka Territorials and Cadets, Temuka and Geraldine returned soldiers, the Temuka Pipe Band, the Salvation Army Band, the children of the district schools, national and local dignitaries, and local folk. Opening proceedings, the Mayor said “We regret that this occasion has arisen, but having done so we must look back with pride at the actions of those who rose to the call of the Motherland, which was in peril. Many of those brave boys who left these shores did not return, and we have erected this memorial to their memory, . . .” Following hymns and scripture readings, His Excellency the Governor-General formally unveiled the monument and the local M.P. read out the names inscribed thereon. The St Joseph’s Church, Temuka, Memorial, an “exceedingly beautiful” monument to the memory of those who had fallen in the war, was unveiled after a Memorial Service on 25 April 1922. During the service appropriate music was provided by the choir and an excellent address was delivered by the Rev. Dr. Kennedy. The name of William Gason was heard again on Anzac Day, 1927. A Requiem Mass was celebrated at St Joseph’s Church, Temuka. The celebrant preached a very stirring sermon based on the Book of Wisdom (Chapter III, Verses 2-5). He pointed out that the Gallipoli campaign and later “gigantic episodes” would remain for all time a wonderful symbol of the age-old courage of men. He reminded the lads present that the enormous sacrifices made by the soldiers of New Zealand and other parts of the Empire were helping them to have brighter and better lives, and that all should render thanks to God, who had delivered them out of the hands of the enemy. William’s medals – British War Medal and Victory Medal – were despatched to his father, as had been the scroll and memorial plaque. Willie's mother was involved in patriotic activities, as exemplified by her donation towards the one hundred leather waistcoats promised from Temuka for the men at the Front. In 1920 Mr and Mrs H. Gason contributed £5 “Remembrance” to the Temuka War Memorial subscription list. Willie’s brother, Alfred Edward Rex Gason (Alf), also served in World War I and was invalided home in 1915 after being wounded at Gallipoli.